You see, I was thinking that not everybody is like me. I like to go see a play or movie tabula rasa, as it were, a blank slate (I learned that phrase in high school). That is, not really knowing anything about it. Sometimes that renders my decision of whether to watch something or not difficult, but that’s my problem. It occurred to me that especially with something like Shakespeare, some people might prefer a little hint as to what is going on. Since I enjoy so much writing about my old movies, I decided to attempt something of that nature for the latest play I am in. Spoiler Alert! I am going to recount the entire plot of The Tempest by William Shakespeare, as far as I know it. Full disclosure: I’ve only read the play all the way through once, and I don’t pay a great deal of attention to the scenes I’m not in. In my defense, during rehearsals I am usually rehearsing my scenes with other cast members or studying my lines. But I think I can give you the gist of things. If you are still confused, go read the script yourself. It is readily available in your local library or even online. The Tempest opens on the deck of a ship which has run into the titular storm. We have a great thunder sound maker as well as a bass drum, and we all do the Star Trek thing of swaying back and forth to indicate the rocking of the ship. A couple of sailors run around trying to bail out the water. It might have been nice to have stage hands sloshing real water onto the stage by the bucketful, or that may have been a little too much realism. Squirt guns and water balloons were suggested but rejected, which I suppose is just as well, especially since our costumes are not of fast-drying material. The ship is carrying the king and some nobles, and it is about to sink. I’m sure the audience will gather that much through our costumes and movements, which is another good thing, because we have a hard time making ourselves heard over the sound effects. I hope we solve that problem, though, because some of us have some pretty good lines insulting the Boatswain. Scene two takes place on an island (not alas, the Island of Dr. Moreau) (see previous blog post). We meet Prospera, the rightful Duchess of Milan, and her daughter Miranda. We learn that years ago, when Miranda was a tot, Prospera’s evil sister Antonia (alas, not an evil twin. I do love an evil twin, don’t you?) stole the Dukedom and set Prospera and Miranda adrift in a skiff or some such. Luckily for them, Prospera’s friend Gonzalo (that’s me, by the way) made sure they had supplies, as well as Prospera’s books. These books have allowed Prospera to perfect her magic powers. In fact, it was Prospera’s magic that caused the tempest, and Miranda should not worry about anybody being drowned. Later on in the scene, Miranda takes a nap and we meet Ariel, a magic sprite or something that Prospera rescued and now owns (slavery was a thing in those days, remember). Ariel is promised her freedom, when Prospera is good and ready to give it to her. After Miranda wakes up, we meet Caliban, a son of a witch (really), who is another slave to Prospera. He’s pretty much a bad hat, repaying kindness with curses among other things. He thinks the island should be his, as it was his mother’s. I guess she was quite the evil witch, and there is something in heredity. Eventually Caliban leaves and Ariel returns with Ferdinand, the son of the King of Naples (who, incidentally, was last seen puking his guts out on the soon-to-sink ship). Naturally, Ferdinand and Miranda fall in love. Like I said, I have not paid too much attention to the scenes I’m not in, but it does not take a Shakespearean scholar to guess that was going to happen. So that’s a long scene, but I finally get to come back on stage, wandering around the island with the King; Antonia, the wrongful Duchess of Milan; Sebastian, the king’s brother (at least, it might be his sister, because a girl plays the part, but I’m being an old man, so it could go either way); and Francisco, who incidentally is played by the same fellow who plays the Boatswain. I hope the audience does not get confused (although I sometimes do, but that’s all right, I’m an old man). I spend much of this scene trying to cheer up the King, but he is inconsolable because he believes his son is drowned. We also talk about his daughter Claribel (I always flash on Claribel the Cow when I hear or say the name), because we were returning from her wedding to the King of Tunis. Antonia and Sebastian spend a lot of the scene making fun of me. The King, Francisco and I fall asleep, lullabied by Ariel, who is invisible to us. Antonia and Sebastian stay awake and take the opportunity to plot to murder the King, to take his throne, and me, probably just because I’m annoying. Ariel returns in time to wake us and foil the plot. The next scene concerns Caliban, Trinculo and Stephano. The latter two are servants to the king, but Caliban takes them for gods and and immediately quits working for Prospera to become their slave. Incidentally, Stephano knows where the wine landed, so they all get drunk, lucky bums. Then it’s back to Prospera’s cell, where she is making Ferdinand work, much to Miranda’s dismay. That’s a short scene, then it’s back to the drunken three. Ariel shows up, invisible (yeah, that’s kind of an oxymoron) (I’m more of a regular moron myself), and makes trouble. Caliban wants to get Stephano and Trinculo to murder Prospera, and then Stephano can be king of the island. At last I get to come back on stage, with the other nobles, and we’re all bone tired. First some weird islanders come on, dance around, and leave us food. Before we get to eat it, a huge thunderclap renders Francisco and I frozen. Ariel come in, as a terrifying harpy, and tells off the other three for supplanting Prospera as they did. They are upset. Back in Prospera’s cell, Prospera has taken Ferdinand into her good graces and gives him permission to marry Miranda, although she sternly warns him against fooling around before the wedding. A few of us come out with Ariel and dance for the young lovers. I get to be one of the dancers, wearing a mask. After the dance I hurry off stage and switch that mask for a wolf’s mask. When the others leave the stage, the other wolves and I set up a clothesline with rich garments on it. Enter Caliban, Stephano and Trinculo. Caliban has brought them to murder Prospera, but they are distracted by the garments. Once they have loaded them on Caliban for easy transport, we wolves chase them all offstage. We’re in the homestretch now. Prospera does a spell, and the nobles (that’s me, the King, Antonia, Sebastian and Francisco, in case you forgot) are led in by Ariel, under an enchantment. At last the enchantment is lifted, and Prospera reveals herself. Wow! Are we ever surprised! Of course they give her back her dukedom, no questions asked. She forgives her rotten sister, largely because it’s the end of the play. Eventually the King and his son are reunited, the Boatswain shows up to tell us the boat is just fine, and the drunkards Stephano and Trinculo return. Then we all bow, hopefully to applause, and I get to take off my costume, which, although I think it looks good, is pretty damn warm for a summer play. 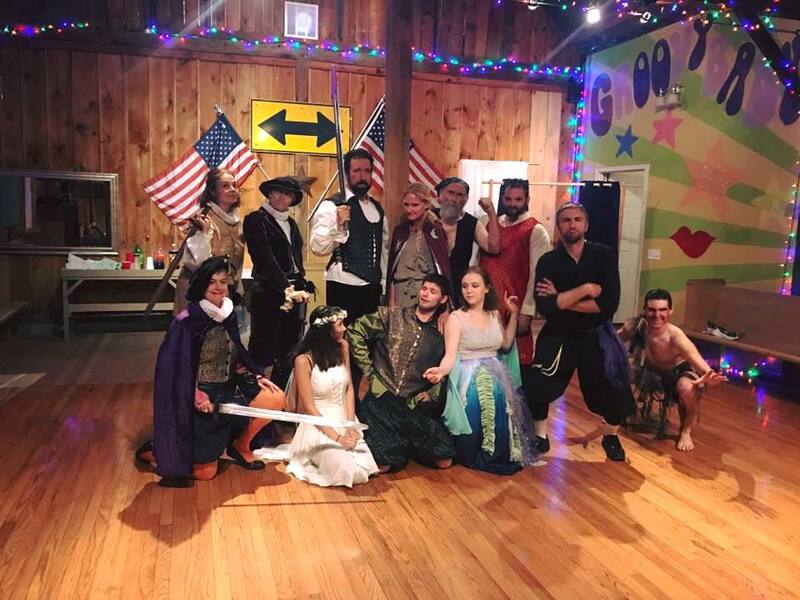 Posted in community theatre, humor, personal, theater and tagged LiFT Theatre Company, plot summary, rehearsals, Shakespeare, Spoiler Alert, The Tempest, theatre. Bookmark the permalink. Pretty snappy synopsis! Well said, and entertaining! Thank you! I’m glad somebody read the whole thing! My Mom was a HS English teacher and we had the Great Lakes Shakespeare Theater now the Beck Theater. 🙂 All kinds of classics and here in German Village we have outdoor Shakespeare. I loved your description and photo! Thanks. I LOVE Shakespeare! I hardly ever get a chance to see it done live, so I am grateful to be onstage doing it.